Graduated from New England College, Henneker, N.H., U.S.A.
with a Bachelor of Arts in Fine Arts and Humanities. Started creating metal sculptures at age 9, and won first prize in the "National Scholastic Arts Awards" in 1961 with a wooden sculpture. It went on tour around the U.S. Went on to experiment in various mediums and kinetic sculpture throughout high school and college, Numerous privately commissioned works in metal were made during this period. 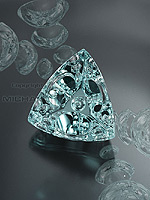 A natural evolution from sculpting various metals to small jewelry sculpture utilizing gemstones. Personally owned and operated a jewelry store, in New London, N.H., form 1970 to 1972. Second jewelry store opened in Avon, CT 1973 to 1975. In 1977, built own studio in Central New Hampshire and has been working there since that time. Confined to the use of manufactured stones in jewelry making, gem carving was the next step in the natural progression. By 1985, became completely engrossed in gem carving, jewelry making was abandoned and full time concentration given over to carving of all sizes, from miniature works to major sculptures. In 1994, he became the first American to ever win 1st Prize in the most prestigious gem design competition in the world, the 25th annual German Award for Jewelry and Precious Stones, Idar -Oberstein 1994. Once again,in 2009, he became the only American to win 1st, twice in the 40th German Award for Jewelry & Precious Stones, Idar-Oberstein international cutting competition. His goal is "to apply the laws of optics, to one of the oldest art forms. Go beyond what as been done. Explore the world of compositional designs. To create infinite designs."